The Visual Studio (VS) Extensions Options dialog provides settings, allowing you to configure the Progress® Telerik® UI for ASP.NET MVC VS Extensions to best suit the needs of your projects. It can be accessed by clicking on Telerik > VSExtensions Options. 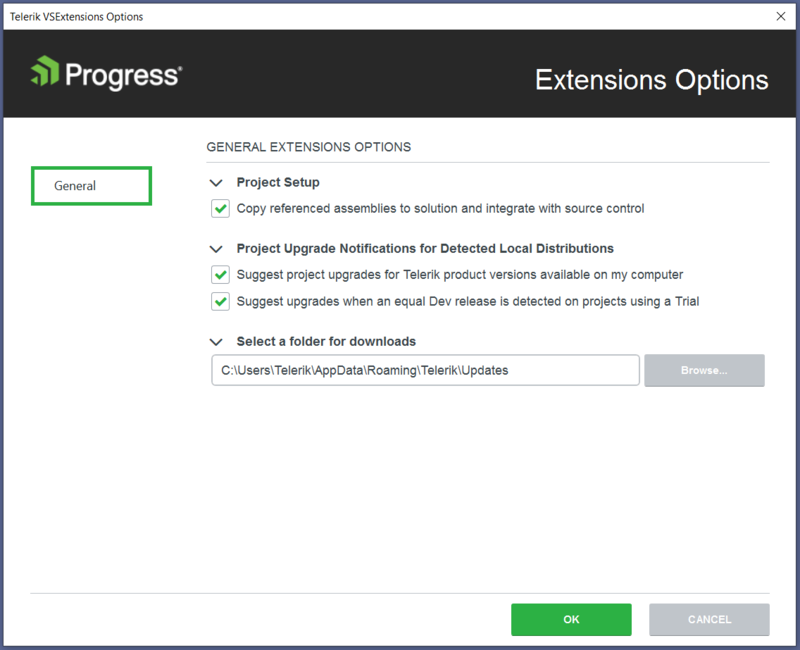 The Extensions Options dialog contains two sets of options that affect the Progress® Telerik® UI for ASP.NET MVC VS Extensions. The settings under the General category affect all of the installed Progress® Telerik® UI for ASP.NET MVC VS Extensions. Set the default value for the Copy referenced assemblies to solution option in the Project Configuration Wizard through Copy referenced assemblies to solution and integrate with source control. Suggest project upgrades for Telerik product version available on my computer—When enabled, you are prompted to upgrade upon opening a project, which is not using the latest version of Telerik products installed on your system. Suggest upgrades when an equal Dev release is detected on projects using a Trial—When enabled, you are prompted to upgrade if a licensed version is available on your system, but the current project uses a trial version. Select a folder for downloads—Configures the path where the extensions look for and store distributions. Changing the folder path does not move existing folder contents from your previous path. Move your previous folder contents manually if you still want to use them. All settings under the Kendo UI category affect only the Progress® Telerik® UI for ASP.NET MVC VS Extensions. Include internal builds in Latest Version update and retrieval—When enabled, the Latest Version Acquirer tool retrieves internal builds as well as official releases when checking for a new version. Show me message when a newer version is available on www.telerik.com—When enabled, you receive notifications if a new version of Progress® Telerik® UI for ASP.NET MVC is available on the Telerik website.